Pictured left to right are Ethan Leisie, freshman cinema production major and Honors student; Todd DePastino, Ph.D.; and Korean War veteran Bob Harbula, who is 86 years old. 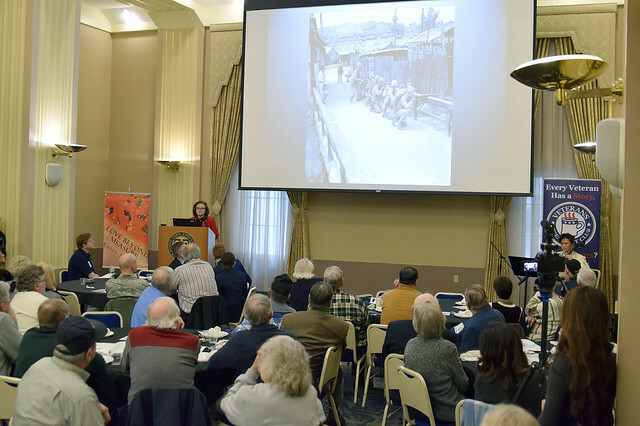 Korean War survivor Ock Soon Lee (Pega Crimbchin) came to campus Jan. 31 to share her harrowing - yet inspirational - story with Point Park University students, veterans, and members and guests of the Veterans Breakfast Club. This was the second veterans event Point Park's Honors Program and History Department co-hosted with the Veterans Breakfast Club, led by Todd DePastino, Ph.D., founder and executive director. Last spring, the groups hosted an event for veterans titled, "The Wonder Women of World War II." Soon Lee described her life as a slave girl, her miraculous survival during the Korean War, often referred to as "The Forgotten War," and her incredible journey to the United States. Fallon brought her Feature Writing class to the presentation to listen and complete an assignment. "As journalists, it's always important that we gather the oral histories of our veterans and their families," said Helen Fallon, professor of journalism and director of the Honors Program. "Many people do not know as much about the Korean War. Ock Soon Lee and the Korean War veterans' stories helped bring the history of that war alive," added Jason Stoebe, part-time history professor. Joining Soon Lee in her presentation was her daughter Katie Schell, author of the book "Love Beyond Measure; Memoirs of a Korean War Bride," who talked about how a portion of the book's proceeds support the California-based nonprofit organization, Women of the Wells. Soon Lee has contributed $1,800 for each well, and is working on her 16th well. The wells have been dedicated to the memory of her husband, Frank Chimbchin, and in her honor. According to Schell, her mother decided to support this initiative because she had to carry water as a slave girl in Korea and knows how crucial fresh, clean water is to survival. "I came today because I was fascinated by the speaker. Also, it's great to see what's happening at Point Park. There are so many smart people here. I admire the University tremendously and its growth," said Clay Hardon, U.S. Air Force veteran and 10-year-member of the Veterans Breakfast Club. The event at Point Park also featured a Presentation of Colors by Pine-Richland High School's JROTC, led by Mike Gasparetto, retired Air Force Master Chief. Additionally, Reverend Matthew C. Reitz of the Air Force delivered the invocation and Younga Reitz from the Pittsburgh Ensemble played her cello. DePastino concluded the event by interviewing several of the Korean War veterans who shared their war accounts with the group. A number of the veterans who attended - approximately 60 - are members of the Korean War Veterans Association in Pittsburgh, a group that still meets four times a year. "I was just overwhelmed by the number of vets who came, who wanted to talk to us, who wanted to share their stories," Fallon said. "We plan to continue working with Todd and his effort. Our Honors students want to bring more veterans and their stories to Point Park's campus for as many people to hear as possible." Point Park University students were inspired by the event and the stories told by veterans. "While I really enjoyed the stories told by the veterans, my favorite moment of the event was during the National Anthem and the Pledge of Allegiance. Witnessing veterans whom were all from different branches and eras saluting the flag and showing so much pride for the country they fought to defend, was such a wonderful sight to see." - Nicolette Jones, senior sports, arts and entertainment management major from South Park High School. "My favorite part of the event was interacting with the veterans and hearing their stories. I was overwhelmed by the history and bravery in the room." - Hannah O'Toole, a sophomore public relations and advertising student from Bishop Canevin High School in Pittsburgh, Pa.
"I'm a member of the Honors Program and I wanted to help out with something that connects to me personally. My great grandfather served in WWII. I never got the chance to meet him because he died before I was born, but I've heard stories and hearing other veterans' stories helped to bridge that connection event more." - Kayla Snyder, freshman journalism major from Shaler Area High School in Pittsburgh, Pa.
"I connected with Ock Soon Lee's presentation a great deal. As someone with an Asian heritage, when I looked at her face, I saw my grandmother. Listening to Ock Soon Lee's story and visualizing it, hit me very deeply emotionally." - Kelly Tran, freshman cinema production major from Norwin High School in North Huntingdon, Pa.
"It was nice to see all of these veterans together in one place. It makes me proud to live in this country." - Elizabeth Turnbull, sophomore mass communication major from Norwin High School in North Huntingdon, Pa.
"I talked to some really lovely people, learned about their lives and heard stories and life experiences that I wouldn't otherwise have known about." - Brianna Wuenschel, a freshman cinema production major from Peters Township High School in McMurray, Pa.